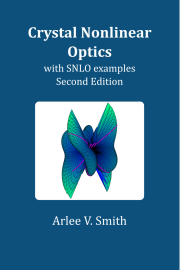 Buy this book and get the most out of SNLO! Same look and functionality as the free SNLO with added features, including Mac OSX and Linux compatibility, improved graphical plotting and faster execution speed! SNLO is free software developed by Dr. Arlee Smith. It is a native Windows application, with several functions to assist in selecting a nonlinear crystal and modeling its performance. It includes data for more than 50 crystals. To download SNLO, please provide information below. It is used only to track the type and number of users for personal satisfaction; it will not be used for any other purpose. I will never e-mail you or give out your information.